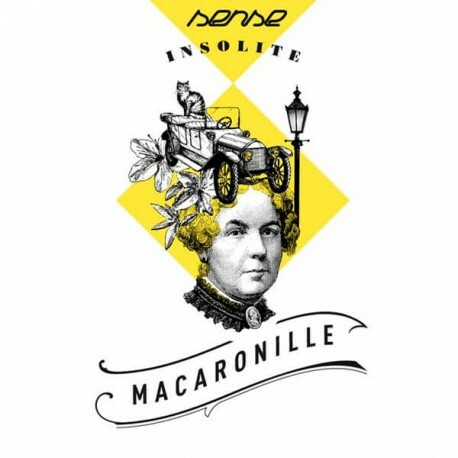 Macaronille Sense Insolite E Liquid : Paris without Macaroons, is like Paris without Love macaron. A noble Parisien dated Madame Gascar on offering him a precious Vanilla Macaroon infused with love. A Macaroon and Love story which seemed to be anchored in time. E liquid for the Electronic Cigarette - 50/50% in PG/VG and available with 4 Rates of Nicotine. The Sense Insolite E Liquids are made by Phodé Laboratories. Insolitement Good ! Dive into the surprising universe of Sense Insolite, succumb in the charms of the burlesque chararcter, get out of the frame and dare. The collection is created without any additives apart from aromas which are 100% natural. Often the ideas recieved are false..... and the nautral aromas are likely to surprise you. Super gourmand, un de mes custards classiques. "Très satisfaite que j'ai l'habitude de consommer"
"Saveur macaron vanille biaisée par l'absence de nicotine."